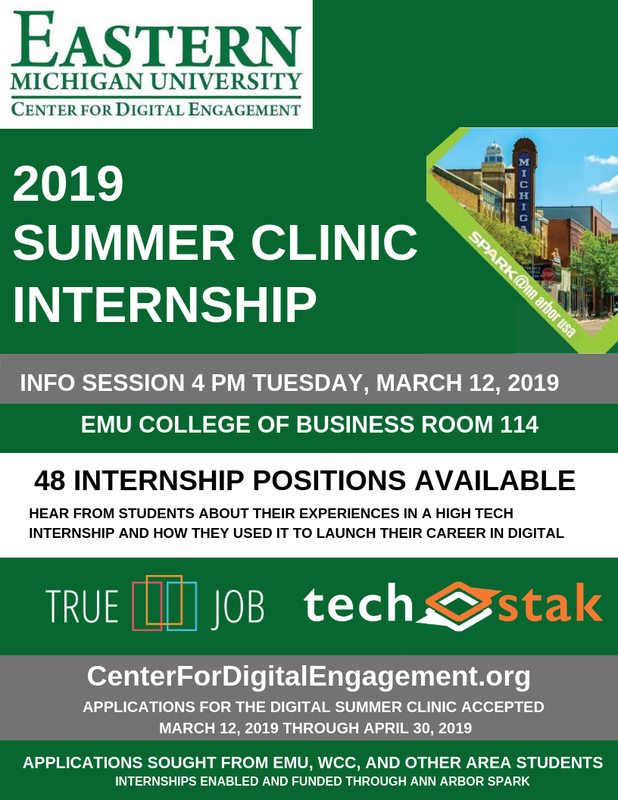 We're pleased to announce the 2019 CDE Summer Clinic Internship. This is a paid internship for 10 hours per week, running from mid-June through mid-August. Compensation is $15/hour. Applications will open March 12 and close April 30. 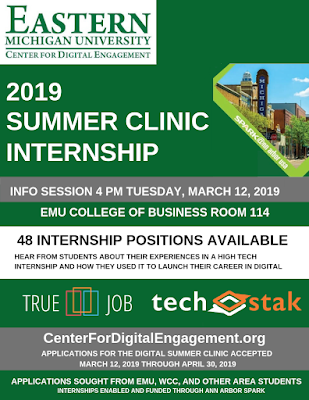 We encourage all interested, current students and recent grads to attend the clinic information session which will be held Tuesday, March 12 at 4 p.m. in Room 114 of EMU's College of Business. The College of Business is located at 300 W. Michigan Avenue in downtown Ypsilanti (Google Maps link). Attending the recruiting event are incubator companies, TechStak and TrueJob,. They will share how interns have helped their start-ups grow. You will also have the opportunity to hear from past students who were offered jobs after the Clinic. We have members of the Clinic mentoring team joining as well who will be happy to share their perspective on guiding students through successful internships. CDE's ongoing archive of articles about the Clinic.